Renewable energy sources are slowly building their presence in the nation’s electric grid system. The grid readily supplies the energy demand of the country, which is now projected to rise 30 percent by 2035. The increasing availability of renewable energy reserves hopes to balance out the rise in demand while providing an environmentally friendly form of sustenance. However, the intricacy of renewable energy requires sophisticated methods of grid operation for both energy management and security applications. The variability of renewable sources are mainly caused by weather fluctuation, but can also be complicated by their long-distance location from heavily populated areas. This uncertainty is handled by grid management systems that properly allocate available renewable energy sources when available, but also quickly switches the energy supply to conventional reserves when a deficit occurs; a similar method is employed for energy excesses. To safeguard the grid’s management system, scientists hope to employ the latest encrypted data security measure — quantum cryptography. A team of researchers at the Los Alamos National Laboratory has successfully demonstrated the use of the new technology to safeguard data transmission. Quantum cryptography exploits the use of physics, rather than mathematical methods, to safely transmit data over long distances. By polarizing the spin of each individual photon in a string, one can transmit packets of polarized photons through fiber-optic cable to a receiver who then measures the photon spin data at the other end. This data can then be converted into a binary code sequence containing any pertinent information. Since quantum mechanics ensures that observing quantum data, in this case the photons, changes the data, one can easily detect an eavesdropper between the transmission endpoints. 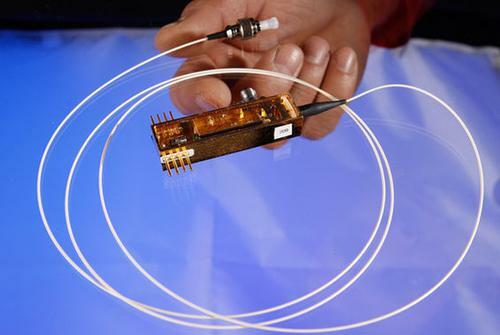 The new technology is based on a recently developed Quantum Cryptography transmitter that supports the advance security measure at a low latency of 120 ms for every 125 km distances. The researchers hope to help energy providers detect any unwanted tampering to the grid’s energy supply, especially with the added complexity of renewable energy management. The team is now in search of funding for a next-gen transmitter designed for mass production. Quantum cryptography may soon be the way of safeguarding all of our data.